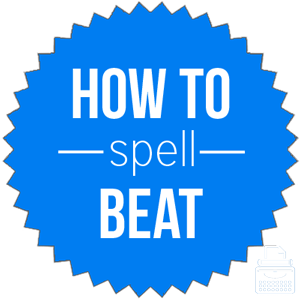 Spelling of Beat: Beat is spelled b-e-a-t. Definition of Beat: The most common definition of beat means to strike or inflict pain by physical abuse on someone or something. In cooking, beat means to mix by stirring vigorously. In music, beat is to strike repeatedly to produce music or a rhythm. Also, beat refers to the act of overcoming or defeating an opponent. Beat may also refer to acting ahead of someone. Beat also means pulsate or throb, as a heart does. As a noun, beat refers to the actual rhythm produced by beating something, such as a drum. It may also refer to a specific moment in time. Finally, beat can describe someone or something as being tired or exhausted. Pronunciation of Beat: Beat is pronounced beet. Beat rhymes with seat and neat. Beat and beet are homophones, which means they have the same pronunciation but different meanings and spellings. What does beat mean? Beat can function as a noun, verb, and an adjective. Most commonly, beat is used as a verb meaning to physically abuse, hit, strike or pound someone or something. She called the police to report that her boyfriend had just beat her for refusing his demands. The corrections officer beat the inmate for no apparent reason, but he was not punished for his actions. However, it has many meanings as a verb, including to win or overcome, or, defeat an enemy or opponent in a battle or a sport. He beat me in the race. If we want to beat the other team, we are going to have to focus and work together. Additionally, as a verb, beat can refer to the pounding or striking of an instrument to make a rhythm. He beat the drum, creating the baseline for the rest of the band. The bored student started to beat his desk with his hands and, within seconds, the rest of the class joined him. Beat also refers to the action of mixing by stirring something swiftly, as in baking or cooking. She retrieved the whisk and continued to beat the eggs until they were well-mixed. The recipe instructions said to beat the ingredients until there were no lumps. As an adjective, beat is used to describe someone or something that is worn out or exhausted. After such a long day, I am absolutely beat. She was obviously beat, for she fell asleep as soon as her head hit her pillow. As a noun, beat refers to the sound made by repeatedly striking something in a specific pattern. She told me to relax and just dance to the beat of the music. The sounds of the soldiers marching created an echoing beat in the streets. Beat off: to drive away from, also vulgar slang for masturbation. Beat around the bush: to explain something or confront someone indirectly so as to avoid offending, hurting, or angering someone. Beat it: to leave quickly; an expression used to rudely tell someone to leave immediately. Beat up on: to physically attack someone or something, usually on a regular basis; to verbally attack or criticize. Beat was first used prior to the 12th century, according to Merriam-Webster’s. Beat comes from Middle English, beten, from Old English beaten, which is related to Old High German bozan, meaning to beat. There are many synonyms from which to choose, however, it’s important to select the appropriate word for the specific context and meaning. Beat can function as a noun, verb, and an adjective. As a verb, it generally involves striking someone or something repeatedly, or, winning against an opponent. As a noun, it refers to a pattern of sounds that form a rhythm. As an adjective, it describes someone or something that is very tired.